Do you want a new, mobile-first, easy to manage website for your locksmith business? Is your current website looking a little dated? Looking for a new website for a new venture? Then you’ve come to the right place. The Locksmith Agency is a niche digital marketing firm that caters to locksmith companies around the country. Having a mobile friendly, easily accessible website is essential if you want to expand your online reach and grow your business. Our team will create a custom site for you that will rank high in local search results, and convert more visitors to paying customers. We are the industry leaders when it comes to providing exceptional websites to locksmith businesses at incredible prices. We have a range of great looking, professional templates to choose from, or we can craft a more custom design based on your existing company logo and your preferred color scheme. Working in the locksmith industry, we understand current issues and trends affecting today’s locksmith businesses. From products to services, our knowledge base is extensive and ever-growing. Staying tuned to industry news allows our web design pros to craft responsive websites that reflect our customers’ professional services and customer care platforms. Our goal is to create great looking, easy to use websites that provide our clients with the online platform they need to market and grow their businesses. If your locksmith website is old, loads slow, or is difficult to update and add new content to, it’s time to put our web design skills to use. The Locksmith Agency features a dedicated team of web designers who create responsive WordPress sites for locksmiths to best showcase their business on the web. Every site we create looks and works great on desktops, laptops, tablets and mobile phones. We don’t have any cookie cutter plans. We tailor each website to suit your unique business profile, services, and products. Moreover, our talented team members will partner with you to craft a site that reflects your company’s individual business personality. 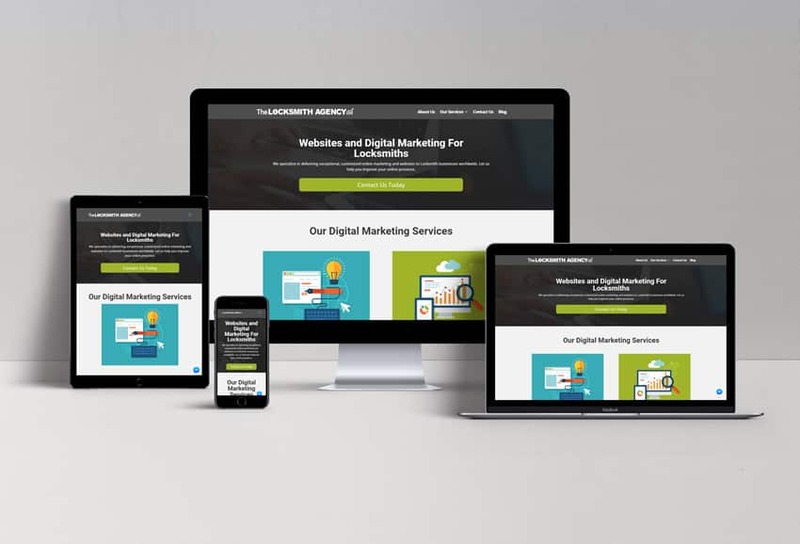 For your business to thrive in the digital arena, it needs a strong website that’s user-friendly, easy to navigate, and effectively markets what your business does. The better your website, the higher you’ll rank in serach results, and the more authoritative your business will appear to potential customers. Is your business putting its best face forward on the Web? Is it generating local traffic? Is you website ranked as high in Google searches as you want it to be? The Locksmith Agency has the tools to ensure that your new website will meet your business goals and drive your company forward. A first-rate website isn’t only about colors, nice images, and cool fonts. These days, if you want to rank high in Google search results, your website needs to be in compliance with industry standards for accessability, SEO, and responsive design. Currently, roughly 56 percent of consumer traffic to the leading US websites is from mobile devices, so we design your site so it works just as well on a mobile device as it does on a desktop computer. Our web designers are highly trained and experienced digital professionals. They’ll custom build your site for desktop and mobile so it attracts customers to your business and allows you to interact with them effectively. These days, a website is more important than a storefront and has a much broader reach in the digital world. When it comes to building websites for our customers, The Locksmith Agency is dedicated to charging fair and competitive rates. We understand that a new website is an essential investment for your locksmith business, but we also know that today’s companies have budget constraints. We’ll work with you to create a site that suits your business needs as well as your budget. In addition to our customized website design, we promise to work efficiently because a quick turn-around time is important to our customers. We also feature secure hosting services. The Locksmith Agency partners with two niche directories: 1800-Unlocks and Fair Trade Locksmith Directory. If you require a brand new, moble friendly WordPress website, or any other related digital marketing services, contact The Locksmith Agency and discover why the locksmith industry turns to us for superior web design. Are You Ready For A Brand New, Awesome Website For Your Locksmith Business? If the answer is YES, click here, fill out our contact form and we’ll get back to you ASAP.